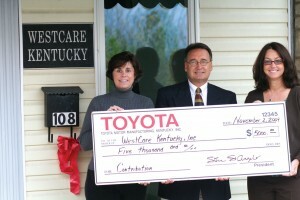 Toyota Motor Manufacturing, Kentucky, Inc. recently made a $5,000 donation to WestCare in Irvine. From left are Estill native Jennifer Noland, Rick Hesterberg of Toyota, and Renee Alexander. Since arriving in Kentucky in 1987, Toyota has donated $34.7 million in sponsorships and contributions to the state’s non-profit organizations. Hesterberg said the company likes to give back to the communities where team members reside. Estill is home to 33 employees of the manufacturing facility in Georgetown. By Don White, CV&T sHomeless people are found only in big cities, right? Some are right here in Estill County. “We have seen people living in their cars on parking lots, and in tents,” says Renee Alexander, a lifelong resident of Irvine. Alexander has served as area director for West Care-Estill County Community Involvement Center since its opening here in August of 2006. The facility, located at 108 Main Street, is currently being renovated to better serve the public. In addition to expansion of office space downstairs, the upstairs portion will include three apartments slated to be ready for occupancy by January of 2011. She says there will be a pair of two-bedroom apartments and a one-bedroom apartment, intended for use by people on the road to recovery from drug abuse. The homeless are often among those people who are addicted, and some have already been in her office to inquire about the apartments. A $250,000 state construction grant received by Estill Fiscal Court through the efforts of Senator Tom Jensen and State Representative Ted Edmonds is helping fund the project. WestCare was founded in Las Vegas more than 35 years ago by a Vietnam vet, Richard Steinberg, who currently serves as CEO, and frequently attends board meetings in Irvine. It consists of a group of tax-exempt nonprofit organizations providing a wide range of health and human services in residential and outpatient environments. In addition to shelters such as the one to be provided in Irvine, services include substance abuse and addiction treatment and prevention, and mental health programs. Services are available to people of all ages, and a focus is placed on aiding people considered difficult to treat. Many of those who continue to be helped are indigent, have multiple disorders, or have been in trouble with the law. The Irvine office served over 300 people last year and is consistently busy aiding people who walk in off the street or are referred here by people like Sharon Hensley with the Kentucky ASAP program. Some of the situations are heart-breaking, says Alexander, a graduate of the Estill High class of 1981. “We cry in here every day,” says the only paid employee of the local office. Wilma Howell and Barbara Spencer share duties as receptionists and are employed under the Experience Works program. Robbie Starling, certified drug and alcohol counselor is a contract employee, and Samantha Bowman of Kentucky Homeplace handles medical assistance cases. WestCare was introduced here by an auditor working in Judge Wallace Taylor’s office in 2004. After overhearing calls to the judge concerning substance, the auditor told Taylor that his father, Tom Sledd, sat on a non-profit board for WestCare in Florida and might be able to give him advice. A few weeks later, an employee of WestCare and the auditor’s father came to Irvine to discuss the drug problem in Eastern Kentucky. The meeting was reported in the Citizen Voice & Times. Upon reading the article, Irvine resident and former state legislator C.D. Noland called his daughter, Jennifer Noland, who was living in Las Vegas and had worked for WestCare there for a few months in 2001. Noland called across town to her old boss, Steinberg, to let him know the WestCare people had made a visit to her hometown and offered her assistance to get the Kentucky operation started. Meanwhile, Pike County leaders had also contacted WestCare asking them to visit their community. After several months of meetings, Congressman Harold Rogers and Operation UNITE gave their support to WestCare, offering to assist in locating a treatment center in Pike County. A regional licensed residential treatment facility for adult males was opened there in a renovated former elementary school in 2005. Although she thought her involvement with WestCare would be for only a few months, Noland has served as vice-president of WestCare Kentucky since January, 2005, overseeing growth of programs in Pike, Estill, and Floyd counties. The goal is to have a center in every county, and Estill is serving as the model for Kentucky. Although her involvement includes lots of grant writing and personal involvement with people crying out for help, Alexander says she’s glad to be in a position to serve others.